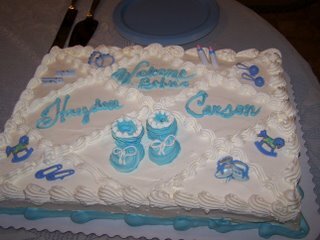 Last Sunday I had my third baby shower. Like the others, we had a good turnout of family and close family friends. The boys got some really good gifts. I am especially proud of the bouncy seats we received. I think the boys will enjoy them a lot! We got a ton of other gifts such as clothes, quilts, baby detergent (very useful, I am sure), and picture frames. With all of these gifts, the boys are already spoiled!